*Censored*……Worlds…Ouch. Having watched 5 b-events, grand-prix, final, Europeans, couple of nationals, Four Continents, Olympics…watching Worlds feels like going to work with a hangover. I just can’t watch skating anymore… No, don’t make watch it please….But every true skating fan is a bit masochistic…..So on Wednesday 21st I found a stream and really hoped that I’ll get a got a second wind. Watching pairs I had two main thoughts. Thought No.1: I think we need to increase the number of teams who get into free program. Dark ages when first warm-ups of the short program was too scary to watch has passed. There are a lot of good pairs, who shows pretty solid skating and I think possibility to compete in a free program also will give them an additional motivation. Julianne Seguin – Charlie Bilodeau, sorry but not in your case. That was the rare case when I was happy that a team didn’t get into the free program. Julianne is so out of shape and free program has too many elements where she can hurt herself or her partner. Even with Moore-Towers – Marinaro on the six place the situation in Canadian pairs doesn’t look promising. Well maybe one day Kirsten will make Michael a good pair skater and I won’t close my eyes from fear every time his back and legs tremble during lifts. But they still need a second pair…..
Maybe they could find someone for Luba Iliushechkina? Maybe this handsome guy Nicolas Nadeau will consider switching to pairs. He’s too tall for quads, but I’m sure with him Luba could easily fly into a quad twist. The Knierims are very beautiful, very touching and Alexa will certainly get her portion of compliments for dresses (in my annual fashion review), but alas in Milan everything went completely wrong. Very nice North Koreans and Czechs. These are the two pairs who I hope will have a great progress in the next four years. Anna Dushkova even burned her crazy stripes and tried to find some gloss. I approve. Thought No.2: Guys, please don’t retire! Who will give us so many positive emotions? Who will show us real Italian passions? Senora Valentina, Senhor Ondrej, do not go! It’s a pity that your best performances of the season didn’t happen at home Worlds, but maybe you won’t agree with me because Olympics are more important for athletes. It’s too early to retire! Take an example from Hao Zhang! Now he will have another portion of virgins’ blood and will aim at Beijing-2022. I hope, at least with the same partner. I have wanted a medal for Vanessa and Morgan for so long and that’s finally happened! Guys don’t quit! You just found your style, you just become a top-pair! After all whose photo I’ll hang on my fridge as a motivation?! Congratulations to Zhenya and Vova on silver, let this medal become a confident starting of a new Olympic cycle for them. I wanted to write that cheers we will not have to watch this awful program in this tasteless costumes … . But I think I say this every season and nothing changes. Is it really that difficult to find someone with taste who can do nice programs for this pair? Come on, they have such an impressive elements, don’t waste their talent on this tastless mess. And the great diva of figure skating Aliona Savchenko. She and Bruno are the only Olympic champions who not only come to Milan but repeated their success by winning worlds gold. Sixth for Alena (Madre Mia!) and the first for Bruno. What can I say? It was very beautiful, an absolute victory worthy of such prima as Aliona Savchenko. And if she decides to retire, I really hope that Aliona will become a coach. The way she managed to improve Bruno …. the guy for whom four years ago it was a victory to get to the free program (I’m afraid to imagine how much and how hard he worked) ….No, the world of figure skating can not lose such a pedagogical talent. 38 ladies came to Worlds in Milan. At the end of such a difficult season 38 is too much … .. Fortunately, only 23 competed in the free program. I hope the rest at least had a great shopping. Let’s start with the sad. For the Russian team, where one girl is better than another, 19th place, even for the third number, is a big failure. I’m afraid the next time their federation won’t rely on Stanislava.….if this “next time” will happen at all. The Americans lost their three spots and I don’t feel sad for them. Because I’m still mad that we didn’t see Ashley at the Olympics. I really missed her mature skating there, because it’s such a rarity now! Mariah Bell probably was already at the beach when she got her ticket to Milan. Triple axel didn’t appear in Mirai Nagasu‘s programs, but empty circle of entry didn’t disappear. And my favorite choreography innovator – Bradie Tennell. Cindeella? Oh no, she needs something revolutionary. Let’s go to the barricades! I don’t know why but I naively believed In Gabby Daleman. I believed that she could take revenge for the Olympics. Alas, Gabby did not want to take revenge( And I hope that if she plans to quit something it’s gonna be experiments with photoshop which really scares me. Masha Sotskova‘s programs traditionally brings me a yawn. I do not know why but during her FP I have time to have tea, have sandwiches, check what’s new on Twitter and many other things. But, Masha, I must give her a credit, saved Russian spots. If she had placed a bit lower, we would have had an unexpected fiasco of Russian women’s skating. It’s hard to comment something on Alina’s performance. The child is tired. It’s also pointless to guess something for the future. Autumn will show, as they say. Whom I really liked it’s Loena Hendrickx. Well done! She surprised me at the European where I saw her skating live for the first time. But she impressed me even more at Worlds where she had two clean programs! I really liked her sensual, thoughtful and mature skating. Of course, I wanted a medal for my beloved Carolina. I wanted her to win a medal at home. But, after the free program, I was surprised to find out that I was not upset about the result. Well, didn’t turn out. It no longer matters. But she gave me an absolutely magical short program that captures you from the first seconds. Carolina is a whole epoch in figure skating. Beautiful epoch and, so sad to say this, already gone. And our quite unexpected podium. It’s always a pleasure to watch Satoko‘s skating. She has sophisticated programs, her every gesture is elegant and musical. Alas, in this strange sport you still have to jump. Kaetlyn Osmond really surprised me. It was such a relief when she managed to skate a clean free program at the Olympics, but I didn’t expect her to repeat that. Turns out she can have more than one clean skate in the season. Kaetlyn, please remember that. Well done, what can I say? She not only repeated, but also improved her last year’s achievement! Such a well deserved gold. I don’t know why, but we really believed last season that it’s possible to have good, clean programs with all those quads. Now the reality is back. Painful reality. At least we had a chance to see both programs of cool guy from Mexico. Damn, someone please help the guy with jumps! He’s a future star, public loves him! What if he’s our new Mexican Fernandez? Somewhere near them placed Matteo Rizzo, an honorary hero of labor, a guy who I guess competed at every possible competition this season. So by the home Worlds he has been already tired, but still well done! He even tried quad. Matteo, me and the whole of Italy have big hopes for you. 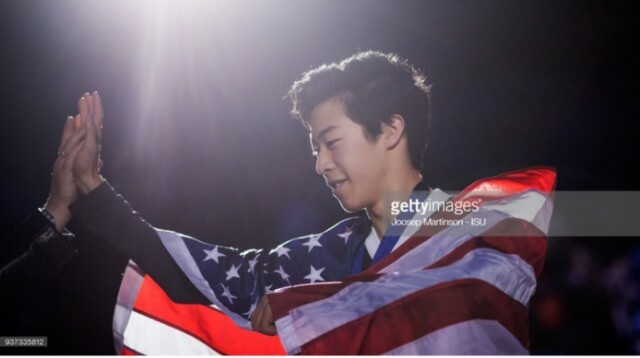 Vincent Zhou – when there’re no jumps, there’s no program. So that was hard to watch. Well done Max, you saved three spots for American men. Max, do not go! I promise I won’t laugh at your programs, I won’t laugh at your tights anymore…..Well, no this’s too much I can’t promise that) But still don’t go, who else’s choreo will give us so many positive emotions?! Gray sweater, Phantom of the opera … Oh, my heart ached. It’s hard without love in figure skating. So I thought that probably I should take a closer look at the young generation of skater and to find someone else….if not to love then just to like. Now the niche for princes charming. Here I have two “D”: Dmitri and Deniss. I like a lot of things in Dmitri Aliev‘s skating, so please don’t kill the guy by all those quads. I like Deniss Vasiljevs since juniors and of course I love his coach. So I’m happy for their 6 place at Worlds. But it’s a bit weird that a guy with no quads places that high…. Kazuki Tomono was the main discovery of the men’s event for me! What a guy! He really wanted to show his best, the audience already loves him. Yep, the star is growing. Lesha Bychenko lacked only one step to get a medal. It’s a pity of course, but still it was not very real. Anyway, great result for this guy! What a season for him! *Salute, fanfare, champagne* Historical moment! For the first time since 2011 the Russian men won medal at the World Championship! Also the return of three spots as a bonus. Misha‘s team finally realized that if the element is unstable, then probably it’s better not to put it into the short program. That even with one quad (toeloop!) you can get 100 points. It was an exorcism of evil spirits from Milan ice. Thank you, good guy, exorcism helped not only on your performances, but also helped ice dancers. Big thank you! Because you know, how dangerous these dances are….like a minefield. The dances were beautiful, but not too exciting. The main buzz will begin now – the traditional off-seasonal migration of dancers between groups. I wonder who will settle where? I don’t think it’s a good idea to go to Shpilband. His duos break-up, regress, Chock Bates didn’t get neither team event at the Olympics nor medal at Worlds. Marina sounds like a wise idea. The Shibs haven’t announced anything yet, but I think the place of second pair in the group is vacant. Lauzons? Well if you want to be 18th, 19th or 20th pair then good luck. Jean-Luc Baker is the best thing that happened in latina this season. I hope his lady will stop falling. Honestly, I didn’t see that Stepanova – Bukin is better than Zahorski – Guerreiro. Ok, I said that. Bestemianova is already looking for my address) The expression of Stepanova’s face in k&c eloquently said that in the status of the first pair they expected at least 114. Again enemies are all around. For the whole dance event, only two dances gave me goosebumps. And one of them is Gilles-Poirier‘s free dance. I underestimated this dance last time and did not expect that they would be able to capture me that much. Piper looks gorgeous, like the diva of old Hollywood. And … since I heard from Tarasova the comparison of their skating with the drops of fresh blood, I can not get rid of this thought. So If I were a movie director and I needed an actress for the main role in a saga about vampires, I’d definitely call Piper) I really hope they will continue. First, there are so few creative pairs, and secondly, I’ve already excited about their tango. In the battle for bronze, my heart couldn’t choose between the Italians and the Canadians. It’s difficult when you love both and there is only one medal. On the one hand, for Anna and Luke this a farewell, last Worlds, Worlds at home and I really wanted them a medal as a thank you for all the joy they were giving us. On the other hand, they are world champions… ..Kaitlyn and Andrew then lacked some hundredths of a point to get the gold. So, probably, in Milan everything turned out the best way. Yes, when Andrew defeated twizzles, the whole arena breathed out loudly and crossed itself. My second goosebumps happened during Madison and Zach‘s free dance. I guess I decided on my favorites for the next cycle. Turns out I never learn. Why couldn’t I choose more consistet duo? There are so many elements in the free dance and Zach Donohue can fail them all. Gabby and Guillaume skated freely, inspired and relaxed. Again in their own league. So I am very curious where this pair will go further. In what direction. Relax, it’s not a criticism. Four years ago, they came with their style, style which changed ice dances. Four years they have been developing this style and their FD to Moonlight Sonata I consider a beautiful result of this development. Now they need to move somewhere further. The only question is where? I’m really curious…. This season is finally over…Cheers! Always a pleasure to read your review !! The North Koreans are a relly pleasant team to watch, I can’t wait to see what they will show us in the future ! Actually I like Guarise/Della Monica. They have both fluidity in their skating and individuality. And this individuality also shows itself in the costumes ! As a French girl, I cannot be anything but extremely happy for Vanessa and Morgan. They finally had their medal ! And they are my hard-working model too ! Speaking of hard-working model, well… I don’t have anything to say about Aliona, just WOW !! Loena Hendricks is very impressive and has some great potential, and she kept improving all throughout the season. And some weird fact : I especially like to watch her doing twizzles… Don’t ask me why! I’m not a fan of Zagitova, but I felt very sad for her. I hope she will use that experience to come back stronger. But, how to guess what her and Medvedeva will show next season? Anyway, I was really happy with that unexpected podium. What a redemption for Wakaba! And as a big fan of Miyahara, I really wanted her to medal, how do you get such fluid skating and beautiful lines? It was a really good event as many did their best performances of the season, it changes from the rest! Anna & Luca made me cry, as well as Kaitlyn and Andrew… I wish there had been two bronze medals ( maybe I’m becoming Russian). Whatever, they both left something fantastic in my heart and I think also in the Ice Dance world. Madison and Zach were really impressive, their free dance is not my taste, but they deserved their medal. I can’t wait to see what they’ll show us in the next four years. And Gabby and Guillaume get their Gold… They gave me goosebumps and that was the best way to end these championships ! Well done, we survived this long season and these crazy Championships ! Oh now, pair skating will loose so much if Valentina/Ondrej, Nicole/Matteo will finish their careers. I really enjoy both teams and think they just found their style, it’s not a time to retire! I’m going to say a terrible thing….but I’m not sure that we’ll see them…at least one of them next season. Ugh, if both Italian teams retire and Italy has two spots…who even would be sent to Worlds??? I also can’t wait for your costume reviews! But take your time; I’m trying to do one right now and it’s exhausting!!! I agree that more than 16 pairs should be able to skate the free program. The pairs field is so deep that one mistake can drop you right out of the free! Since when did this become a thing? When I first saw Seguin/Bilodeau in 2015, I adored them. I thought they were the future of Canadian pairs after Duhamel/Radford took their rightful throne and retired. But here they just didn’t look ready to compete. Maybe they stopped training after the Olympics. Anyways, they will need to regroup if they want to be competitive next season. 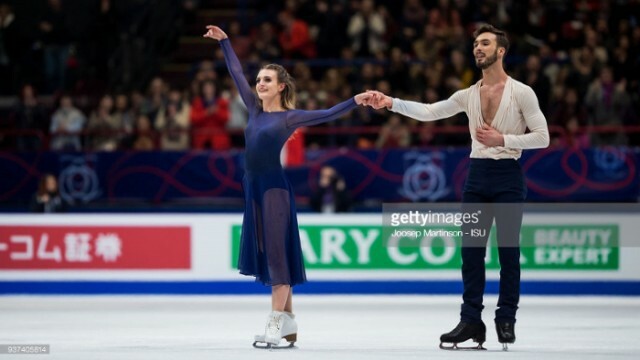 Kirsten Moore-Towers and Michael Marinaro remind me of Aliona and Bruno 4 years ago: she is really the one supporting the team, and he is trying to keep up. My hope for them is that in the next four years, they follow the road of the divine empress Savchenko and get similar success. But alas, there is only one Aliona and Bruno. You have no idea how much I miss Luba. Such beautiful arm movements, such breathtaking lifts! It would be a shame if she retires. She is still young and she has that quality of a Berezhnaya, a Gordeeva. Well, maybe she’ll also follow the Savchenko Road and pick some guy we’ve never heard of, and someday they’ll be legends. I need something to hope for right now. As an American and a pairs fan, I want to have faith in the Knierims so much! Yes, sometimes the jumps give them trouble, and I’m not sure what happened to the death spiral this time, but they’re so beautiful to watch and I just love them. Sometimes you can love a skater so much that you don’t care if they’re making mistakes, and these two are like that for me. Is it true Valentina and Ondrej are retiring? Ugh, what a shame. They just light up the ice with their special Italian sparkle and I’ll miss that. I like the pairing of Yu/Zhang. They have such contrast: she is like a beautiful flower, and he is a stone fortress. Unfortunately, the flower sometimes struggles to land side-by-side jumps. I’m happy for Vanessa and Morgan’s bronze. I’m glad they switched back to their old FP; “The Sound of Silence” fills up the arena in a way “Say Something” couldn’t quite do. They’ve brought a breath of fresh air into skating with their programs. If I’m not mistaken, they will skate one more year and then retire. I agree about Tarasova/Morozov. How did Peter Tchernyshev, the man who gave us the Shibutanis’ “Fix You” and Kavaguti/Smirnov’s “Manfred Symphony”, let this happen? It’s not like they went to some inexperienced choreographer who didn’t know anything about how to create a program. And as for costumes, it should not be difficult to make a decent dress for a young, beautiful blonde. I don’t even have words for the magnificence that is Aliona Savchenko and Bruno Massot. There is no one like them. So all hail the queen and let’s get on with the rest of this long comment. I can’t understand how Russia can be overflowing with talented girls yet Stanislava, a girl I have only seen once, ends up at Worlds. (Maybe they were relying on the Tennell effect???). She’s a nice skater but I don’t see her ending up at the top of the podium anytime soon. Ashley is always American queen in my heart. I root for Mirai too, but only because I admire her fight. Ah, Ashley, is it time to start training a triple axel? I don’t want to blame Bradie for what the US federation did. She has done nothing wrong in this matter. But for heaven’s sake, get the girl a program that shows off her strengths!!! Cinderella is a program for Satoko Miyahara, a pretty skater with controlled movements. Bradie’s skating relies on jumps, so they need to get her something more aggressive. And please do something with her hair! It’s going to sound cheesy, but I think they sent Cinderella to the ball still in her rags. I love Gabby Daleman – she has huge jumps, strong programs, and always the best makeup. But for some reason it didn’t happen for her. Well, I’m an optimist, Rome wasn’t built in a day. I actually don’t mind Masha’s FP so much, but the SP is great for taking a nap. I don’t know why they keep giving her these princess programs, especially when she was so interesting in juniors. It’s always funny to see a girl dressed like a Barbie doll slapping her legs before she skates. 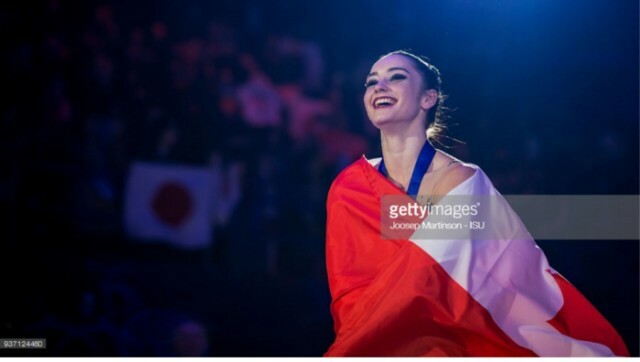 And unfortunately her clean jumps seem to have left her at GPF and Nationals :( But she saved the spots and the Russian fed should send her a big gift basket. Poor Alina just seemed exhausted. Girl, I can understand. It’s exhausting for us fans too. At the beginning of the season, I was screaming “what is with this girl who puts all her jumps in the second half? I hate it!” But I feel bad for her. And somebody, please protect her from the wrath of Eteri. I love Loena Hendrickx too! I think she’s got a bright future! I wanted Carolina to medal so badly too! Her SP gives me goosebumps every time, and I’m so happy it reached its full potential at home. Unfortunately, the same can’t be said for the free program, but I will remember the SP in 10 years. I’ll admit I’m not a fan of Satoko Miyahara. She is a pretty skater, but in general I don’t really like classic princesses on the ice. But she has the refined movements that get high PCS, so I’ll forgive her underrotations and tiny jumps and just be happy she got a medal after being 4th at the Olympics. I’m still screaming for Wakaba! I don’t think revenge has ever tasted sweeter. Her Skyfall FP is my favorite program this year, and I still remember that horrible day I woke up and found out she was not going to the Olympics. Maybe she doesn’t have the delicate skating like Satoko, but this program showcases all her strengths and builds with clean jumps. I want the same kind of program for Bradie. At the beginning of the season, I predicted “It will be Kaetlyn, not Alina, who is the biggest threat to Medvedeva.” Well, looking at the results of the Olympics, I can see I was wrong. But I guess I always believed in Kaetlyn. And sometimes the stars align at the right time. I’m also glad at last we have a mature woman with proper jumps and artistry for world champion instead of a little girl we won’t see in two years. So I was very happy with the ladies’ event. I’ll admit, I didn’t even watch the event. I just checked Twitter, saw how messy it was, and decided to save my time. I really liked Boyang’s SP this season. So to see him struggle so much in the free program was hard. Watching Vincent, I had the selfish thought “Jason Brown deserved better.” Unfortunately, that’s not how it works. It’s so funny that Russia medaled in men’s, but not in ladies. I like Mikhail a lot; he has nice lines and beautiful jumps…when he lands them. I still hold my breath every time he jumps. Shoma’s FP broke my heart. I don’t quite understand how guys are allowed to fall 3 times and get silver medals, while pairs skate clean SP’s and don’t get to skate a free program at all. He put up a good fight; now I hope he rests his ankle and comes back for the world title next year. But I do not dare to fall in love with his skating. The last time I fell in love with Olympic silver medalists who are cursed to win silver in everything…well, let’s not think about that. Nathan’s SP is unique, cool, and worked for him. The cute curls just make me smile. Unfortunately the FP is just quads, quads, and quads. And there’s not even a flashy red-and-gold costume to help this season. First of all, the scoring for everyone was outrageous. I think Stepanova/Bukin have been pushed too early. They are an average ice dance couple, burdened with trying to be Russia’s no. 1 ice dance team. And they’ve started to believe that they are really that good. I guess it’s more Tennell Syndrome. Their mushy romantic FD with voiceovers and lyrics makes me laugh, but at least they had a cool SD. Any couple who skates to Sia gets a spot in my heart. I like Gilles/Poirier’s FD. They’re creative, they’re unique, and with Canadian ice dance clearing out, they’ve got a shot. Usually I hate yellow dresses on the ice (yes, I’m still dealing with the trauma that comes with polka dots), but Piper wins for best dress. By the way, I’ve been craving a good vampire-themed program since Volosozhar/Trankov’s Dracula; can someone suggest this to them for next season’s FD? And I can’t get over how much she looks like Gwen Stefani. I like Cappellini/Lanotte but my heart was with Weaver/Poje. I was singing every word of “Je suis malade!” in my room as I streamed the event. For me, that FD will always have a special place in my heart. It reminds me fiercely of Carolina’s SP. Note to future skaters: If you perform to heartbreaking French music in a burgundy dress, I will love you. Madison and Zach’s FD always makes me feel like I’ve just walked in on a couple having an affair. They have this intense, soap-opera romance quality to their skating. Unfortunately, the soap opera often involves odd falls. Lucky for Zach, this time everything turned out all right and they are World Silver Medalists. But may I please warn you not to fall in love with silver medalists? It’s too painful, sister! Gabriella and Guillaume are lovely skaters, but Moonlight Sonata did not work for me. I just can’t watch this program without yawning. I guess it’s the price we have to pay for Ed Sheeran in the SD. Yes, it’s a good thing I don’t have neighbors close to me, because I sang along to their SD too. I watched the official practices at Europeans and there this program “Say Something” really carried me away! It was amazing and they skated it so emotionally. I was impressed so much and expected them to even surpass this impression at competitions. Unfortunately it didn’t happen. Maybe this program needed more time. She was 4th at the Russian Championships which made her a first substitute. So the russians just followed the principles of sport. Besides, I think there were simply no one else ready…. Let’s suggest Paiper and Paul doing Interview with a vampire. Ha-ha….I loved 3-time World Champion and that wasn’t easier. Who would have known…. Vanessa and Morgan’s “Say Something” was really beautiful. I thought it was one of the good pair programs this year. But give me the choice between dramatic and romantic, and I will choose dramatic every time. Maybe they can use “Say Something” for the gala – that would be awesome. I understand how Stanislava ended up at Worlds, but it just seems funny. I guess with Pogorilaya injured and Lena and Liza not skating so well, that’s how it happened. I agree with you about Bradie. When I first spotted her at Skate America I was very impressed. The girl has great jumps, spins, and speed, and she earned her spot at the Olympics fairly. But the packaging is so beneath her. To me, skating to “A dream is a wish your heart makes” is something you do as a little girl, not a 20-year-old national champion. And every time I see her, I want to either style her hair like Evgenia Medvedeva’s or give her a cute bob. We’ve had so many boring American princesses and I just want to see something new. I guess she is the Tarasova/Morozov of ladies. Oh, I haven’t had to eat chocolate for men’s since US Nationals. And without Yuzuru, Javier, and Patrick, there wasn’t much to watch for me.